The wipes used in cleanrooms often go unnoticed and do not warrant much thought from most users. It’s a clean cloth, right? Yes, it is. Measured and controlled in more ways than most realize. A review of a thorough Technical Data Sheet illustrates the many means of scrutiny. The effective production of ultra-clean wiping cloths involves many costly process and control parameters required to meet end client specifications. These products are used in many industries and applications for critical cleaning success with unique and common criteria. In effort to improve and standardize, we meet these varying criteria through one vertical production process. There’s much to do when making a clean cloth. Teknipure manufactures synthetic wipers from raw material (whereas, most buy roll goods), we start with the yarn and ultra-pure water. Ultra-pure deionized (DI) water is our washing effluent and critical to our process results. We have defined product specifications and criteria for the raw materials, thus beginning our Lot Traceability. Materials are constructed in-house (typically knit) in an environmentally controlled facility (no silicone, low particles) then prepped and washed in ultra-pure water prior to release to production. Our DI water meets demanding micro-electronic and medical specifications. We control our water cleanliness (particles), resistivity, total dissolved solids, total organic compounds, and endotoxins, thus considered Water for Injection. Wipes are processed, then cleanroom laundered, tested and packaged. Control elements (product specifications) are the measurement points in a Lot Number Certificate of Conformance. Our primary control points include: weight, thickness, absorbency, particles, fibers, NVR’s, ionic and trace metal levels. Particularly, pre-saturated products (ready for use) involve many additional production controls for the benefit and safety of the product and cleanroom operators. 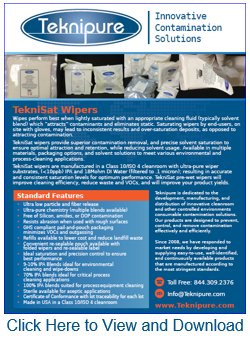 TekniSat products are made with ultra-pure water and solvent (typically Isopropyl Alcohol) in an ultra-clean environment. Since these solvents are considered flammable, many controls must be in place for safe production. As we have recently moved into a larger facility and cleanroom with automated production, we can attest to the complexity. The new Teknipure cleanroom features Clean Dry Air for pneumatics, DI water for rinsing, and ultra-pure blended fluid for dispensing in our closed loop system. Our controlled accuracy features <0.025% deviation ensuring precise and accurate saturation. Our solvents are automatically blended and pumped into our Class 100 production room (Class 1 Div. 2 classified), where they are precisely dispensed and sealed in user-friendly GHS compliant packaging. Our cleanroom displaces air every 20 seconds filtered through ULPA filtration for maximum cleanliness. It is also controlled to monitored for air flow, IPA concentration, RH (relative humidity), and ESD (thru Ionization). All monitoring includes visible and audible alarms with auto shutdown if required. 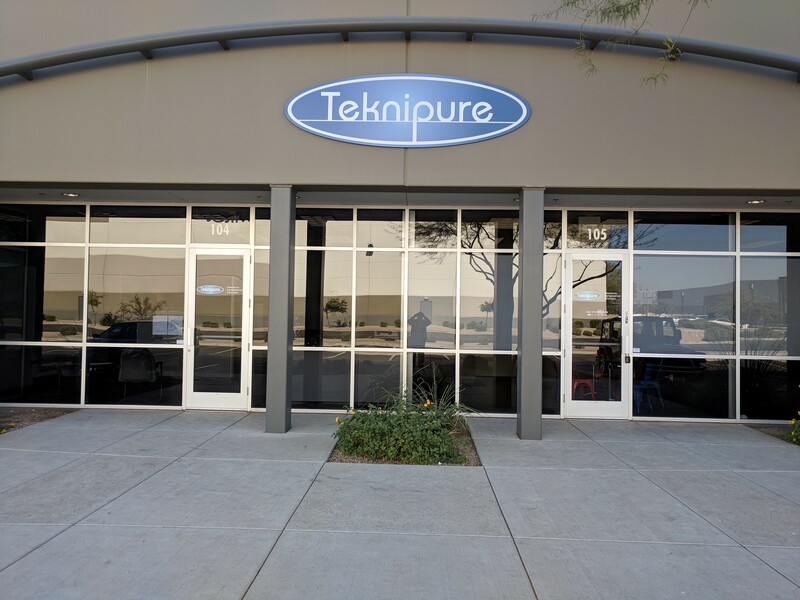 Teknipure has moved into our new facility, the production line is up, and we are ready to begin supporting your pre-saturated wiper needs. We are delighted to share with you, that our move to the new facility is complete! Being in the new facility is not only nice and exciting – It also marks a serious upgrade in the quality of service we can provide you, our valuable customers. In addition, the new facility houses a brand new and state-of-the-art cleanroom, probably one of the most advanced cleanroom in North America. 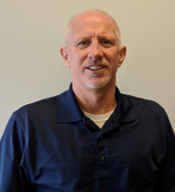 We are very happy to announce two new additions to our team: Dale Foster, our new Chief Financial Officer, and Angie Ruiz our new Customer Concierge! 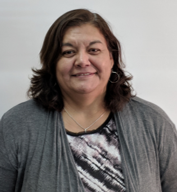 Both Dale and Angie are seasoned professionals in their respective fields, and we are delighted to have them.